OMRON is a leading Japanese industrial automation and electronics brand. The company is a competitive and fast growing manufacturer of control systems and factory and industrial automation equipment, machinery production and control. Some of ots products are proximity, optical and inductive sensors, switches, electromagnetic and time relays, control components and many others. OMRON products are used in car and medicine equipment, high-tech control and automation devices and electronics for home and professional usage. Micro Switch SNAP ACTION VX 5A / 250 VAC without roller Non-retaining micro switch 5A / 250 VAC without roller. Microswitch, D3V-166-1A5, 16A/250VAC Microswitch non-holding, with actuator size 25.5 mm and 3 x 4.75 x 0.5 mm connectors. Electromagnetic relay G2R-1-E, coil 12VDC, 16A / 250VAC, SPDT 1NO + 1NC Electromagnetic relay G2R-1-E with coil ated voltage 12 VDC, contact load capacity 16 A / 250 VAC and contact system SPDT 1NO+1NC. Sealed Ultra Subminiature Basic Switch D2HW-A201D, ON-(ON), 0.1 A/125 VAC, 2 A/12 VDC, IP67 Microswitch, subminiature snap-action D2HW-A201D pin plunger, SPDT 0.1 A/125 VAC, 2 A/12 VDC, ON-(ON), IP67. Electromagnetic relay G6RN-1, with coil 12VDC, 250VAC/8A, SPDT Electromagnetic relay G5V-2-H1 with rated coil voltage 12 VDC and contacts load capacity 0.5 A / 125 VAC. 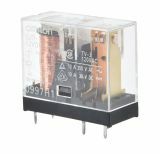 Electromagnetic relay G5V-2-H1, with coil 12VDC, 125VAC / 0.5A, DPDT Electromagnetic relay G5V-2-H1 with rated coil voltage 12 VDC and contacts load capacity 0.5 A / 125 VAC. Electromagnetic relay G2R-1, with coil 12VDC, 250VAC / 10A, SPDT Electromagnetic relay G2R-1 with rated coil voltage 12 VDC and contacts load capacity 10 A / 250 VAC. Electromagnetic relay G2R-1-E, with coil 24VDC, 250VAC / 16A, SPDT Electromagnetic relay G2R-1-E with rated coil voltage 24 VDC and contacts load capacity 16 A / 250 VAC. Electromagnetic relay G2RL-2, with coil 24VDC, 250VAC / 8A, DPDT Electromagnetic relay G2RL-2 with rated coil voltage 24 VDC and contact load capacity 8 A / 250 VAC. Electromagnetic relay G5V-2, with coil 12VDC, 125VAC / 0.5A Electromagnetic relay G5V-2 coil rated voltage 12 VDC and contacts load capacity 0.5 A / 125 VAC. 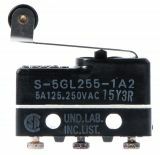 Electromagnetic relay G5NB-1A-E, 12VDC, 5A, SPST-NO Universal electromagnetic relay G5NB-1A-E with rated coil voltage 12 VDC, contact system SPST-NO with parameters 5 A / 250 VAC. Microswitch lever with roller, SPDT, 3A / 250VAC, 19.8x6.4x10.2mm, ON- (ON), SS-5GL2 Microswitch non-holding, size 14.5 mm and 3 x 2 x 3 mm connectors. Microswitch lever with roller, SPDT, 5A / 250VAC, 20x6x10mm, ON- (ON), SG-5GL2T Non-retaining microswitch with 19 mm activation element and 3 x 6.3 mm connectors.